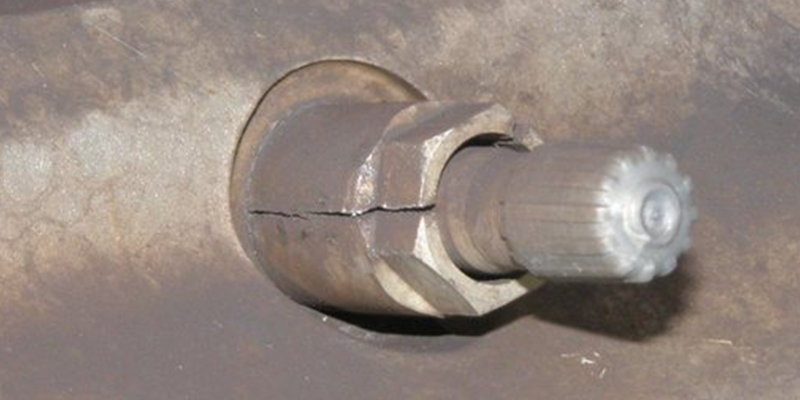 A cracked lug nut that holds a TPMS sensor. Emerging automotive technology is both exciting and challenging. There are many new opportunities for additional passenger vehicle service, and one that’s been around for a while now is tire pressure monitoring systems (TPMS). We are quickly approaching the point that the average-aged vehicle on the road will have a direct TPMS. That means more vehicles with TPMS will come into your shop that will need attention. Do you know all the points of service, and more importantly, are you trained in them and ready for your customers? 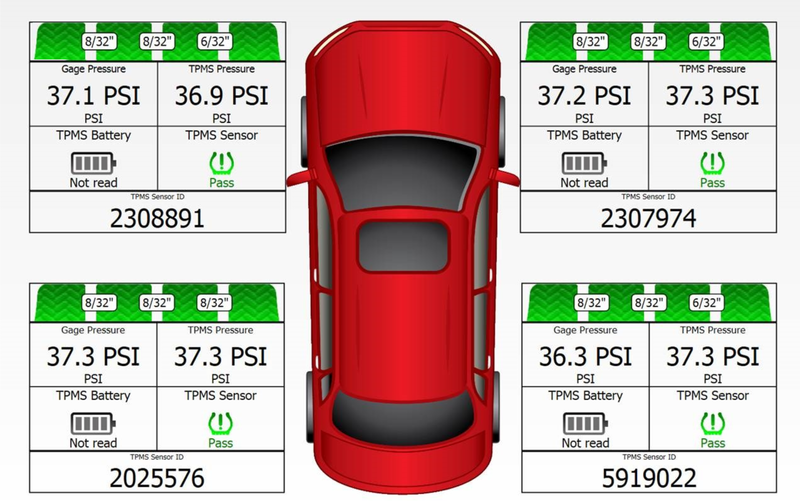 There are six points of service for TPMS, ranging from pre-inspection to the relearn. Each are very important steps, and they should be the basis for your business’ service plan. Today’s automotive repair shop had better be practicing “scan in and scan out.” Scan in means accurately identifying the customer, their vehicle and any and all issues before work begins. As this relates to TPMS, before any wheel and tire service begins, check the sensors and check the system. TPMS sensors with dead batteries can sometimes take days to show up as a TPMS MIL (flashing light). 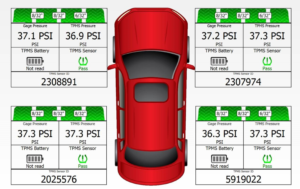 Do yourself and your business a favor and make sure you and your customers know the status of their TPMS sensors. This also means the physical condition of the sensors. A visual inspection of the TPMS sensors can let your customers know when their sensors are damaged or heavily corroded. 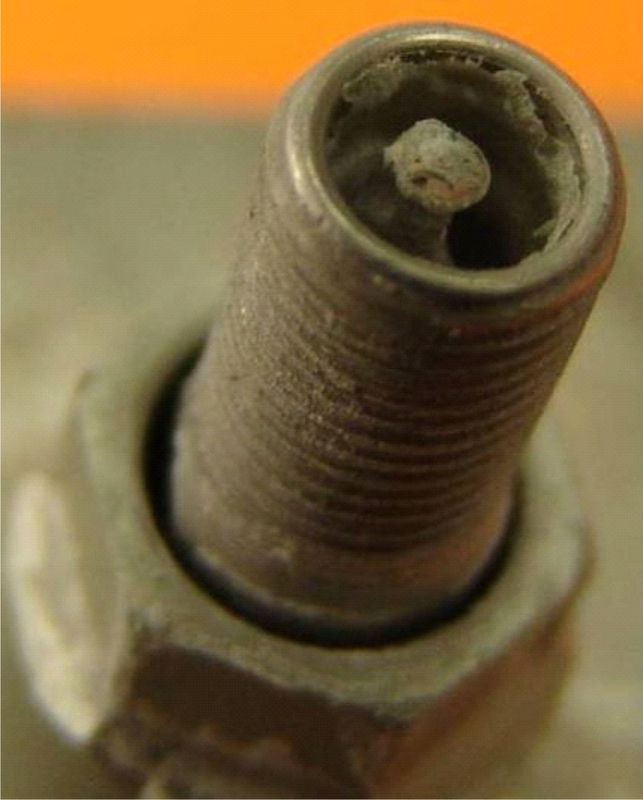 Replacing a corroded valve stem (above) or addressing a cracked valve stem (below) is an opportunity to better serve customers while reducing comebacks. Testing the sensors and checking for system fault codes not only uncovers potential service opportunities, it provides a baseline of service or in other words, prevents you from owning someone else’s problem. Best practices also include tire inspection, tread depth measurement and collecting the tire identification number in addition to the TPMS check. Presenting this critical safety information to the consumer protects them and your business. Another industry best practice is to always replace the wear items commonly found on most TPMS sensors. For the same reason the rubber valve stem is replaced, you should also replace the seals, grommets and other items found on TPMS sensors. The U.S. Tire Manufacturers Association (USTMA), Tire Industry Association (TIA) and many vehicle OEMs all say that every time a tire is taken off the wheel, these items should be replaced. The question is, why wouldn’t you? Rubber seals break down over time and are prone to leaking if the sensor is moved or twisted during the tire dismounting/mounting process. Replacing the service kit with regular tire service will maximize the life of the TPMS sensor and prevent customer dissatisfaction due to leaks and flats. Don’t forget that TPMS service kits protecting your customer’s investment represent a great opportunity to add revenue to your business. Sensor batteries fail. As I mentioned, the number of sensors on the road is growing, and the average-aged vehicle has TPMS and is approaching 12 years in age. The sensors themselves get damaged either while driving or during service. The fundamental component of the vehicle safety system otherwise known as TPMS is the sensor. If it’s broken, fix it. Keep the TPMS operating to keep your customers safe. Not entirely different from sensor replacement is new sensor install. Typically, the customer wants a different set of wheels and tires for their ride. Or, they may just want winter tires. Either way, we know that keeping a TPMS operating is a requirement, so in this scenario, we install new sensors into the alternate tire/wheel package. Many times, these sensors can be one of the many alternatives available in the aftermarket. The most common aftermarket offerings are programmable, multi-protocol and direct fit. Programmable offers great flexibility but requires a programming device. Multi-protocol sensors have similar flexibility without the programming step. However, it’s not uncommon to have more SKUs. Direct fit sensors are the traditional “part for part” equivalents. Many know this as “placard.” Prior to TPMS, we could, shall we say, “get away with” a bit more in terms of how we selected wheels and tires for our cars. If you need any evidence of that, I urge you to visit the Global Tire Expo at SEMA, where the creativity of wheel designs and fitments seemingly has no bounds. That said, however, serious wheel and tire professionals have always known that maintaining proper load-carrying capacity of a car or truck is critical, and it’s directly tied to recommended inflation pressure and the proper wheel and tire fitment. Recommended inflation pressure is what drives the TPMS. A low pressure (solid) TPMS light means one or more of your tires is below 75% of the recommended pressure. There are situations, whether it be plus sizing or up-fitting tires, in which the recommended pressure and placard label need to be adjusted. TPMS relearn is process of programming new sensor IDs or repositioning existing IDs in the vehicle control module. This should always be done after sensor replacement and when necessary after a rotation. This is the “finishing step” after wheel, tire and sensor service is complete. Not only does the relearn get new IDs programmed to the vehicle, but it also creates a baseline for the next service visit. If you are in the auto repair and service business, particularly wheel and tire, these are the services that need to be listed on your menu. Performing these services at the proper interval takes commitment and investment in tools, training and inventory. Providing these services will add value to your customer, increase your shop’s business, and add to your bottom line. Finally, to bring all of this information together along with the service data, don’t forget the importance of point of sale or shop management systems. Linking customer information from the data collected from your tools to repair results means that you can paint a complete picture of the status of a vehicle’s TPMS for your customer. Inspection and service reports make it easy for you to help your customer understand the current status of their vehicle, what services you can provide, and most importantly, it gives them the confidence of a job well done. TPMS service is made up of six basic steps, and successful shops will embrace them all, and tie them together with a solid shop management system. Scot Holloway is the CEO and general manager of Bartec USA, the North American arm of the Bartec Group, a global supplier of TPMS equipment, tools and solutions. He holds a Bachelor of Business Administration degree from Northwood University and is a TIA-certified ATS Advanced Instructor. For additional information, visit www.bartecusa.com and www.bartecautoid.com.